A little over a week ago, I organized, and with help from many others, ran the first (annual? occasional? only?) Georgia Peach Matches. The program consisted of smallbore rifle indoors at 50 feet 3×40 qualification and final, and air rifle 10 meters 60 standing qualification and final, all fired under USA Shooting rules. Most competitors fired at the University of North Georgia and a few fired simultaneously at Georgia Southern University. We had a mix of high school students, ranging from beginner through advanced, college students, and one Olympic team member. A number of the young athletes shot very well with respect to where they are in their journey. One of the participating athletes was Molly McGhin, a 16 year old advanced athlete with significant national match experience. She shot well in all 4 events. Her air qualification provided some interesting insights, both for the statistically minded and for those interested in the psychology of high performance. The decimal score was 618.3, good for 2nd place behind the Olympian’s score of 620.5 and her integer score was 592-40x. None of their scores were world class, but are certainly quite respectable for a pre-season pick up match. Normally, we like to spend time looking at the “inner group” first to reinforce the aspects of the process which went well. At the same time it is instructive to take a quick look at the “outer group” for insight and reminders of areas for improvement in the process. As I looked at the score sheet for this athlete, I detected some interesting patterns and decided to do a histogram of her match, as shown above. Looking at the “outer group” we see only 7 shots which scored below 10.0, meaning 53 shots scored 10.0 or higher. Interestingly, if these 7 shots had scored at least 10.0, she would have won the match by 0.2 points or more. (Of course, then her integer score would have been 600.) The competition is tough at the top! We spent almost no time at all talking about the widest shot of all, since she rarely shoots anything below about 9.5 or 9.6. In fact we laughed about “the one that got away” and we moved on after she made a quick comment about what had happened. We aren’t worried about a repeat and certainly won’t spend time talking more about it. We focus on where we are headed, not on where we have been. The only reason I mention it here is because many people will make a big deal of that particular shot. It is no big deal and we moved on. It is the “inner group” which initially caught my eye on the score sheet, demanding a histogram and further reflection. Often, an athlete’s shot distribution will cluster around a value consistent with their level of experience and capability. Conversely, this histogram shows a different, bi-modal pattern. As an aside, notice the 4 shots at 9.9. It isn’t your imagination that we get lots of them! Why are there 2 primary modes and why is there a gap of only 5 shots in between? To understand, we must first go back to where I first observed the phenomenon. Upon examination of the target, with 25 shots, we discovered a swarm of shots from about 10.3 or so to 10.9, then an untouched area of about 10.2 to 9.6, then a sparse sprinkling of a few shots from about 9.5 and lower on the target. The inner group and outer group were separated by a “no man’s land” of no shots. Because the free pistol target is so large when compared to a 10 meter air rifle target, and because free pistol shot dispersion can get pretty wide all too quickly, the bi-modal clustering actually had a gap. Instantly I knew why and explained to my friend. During my motorcycle racing days I had taught myself Flow, learned how to set the stage, and often spent extended periods of time deep in the Zone. It didn’t hurt that the threat of imminent death or maiming clarified and crystallized my focus! I had adapted this knowledge to my target shooting, especially free pistol because of its difficulty. Even when not in Flow, I had learned to shoot without mental and emotional interference. When discussing this one day with Abhinav Bindra, he talked about learning to “manufacture a shot” when there was no Flow and there still needed to be no interference. Watching him shoot was a treat and a clinic all in one. Why did my target have such a strong bi-modal pattern? Quite simply, the inner group was fired by the deeper mind without interference (e.g. no outcome focus, no worry, and no attempts at control) while the outer “group” or ring was fired by the active mind with interference (e.g. outcome concern, taking control of the process). Results are the outcomes we desire. Some forms of outcome are obvious: winning, score, making the final, earning a Junior Olympics invitation to the Olympic Training Center, etc. Other forms of outcome are less obvious: wanting to impress a college coach, not wanting to be embarrassed, etc. Still other forms of outcome are hidden deeply: wanting to feel good about oneself, not wanting to feel inadequate, no good, useless, etc. Performance represents our capabilities. We spend countless hours honing our equipment, positions, and technique. Almost all our effort goes into this part of the equation. For most athletes, 99 to 100 percent of their time is spent in this area. We constantly work to improve our technique and improve our ability to perform. Interference is all the factors reducing our performance. The primary factor here is outcome focus, which is the cause of choking. (See my article archive of the On The Firing Line series for articles Choking and Choke Proofing, which was referenced in US Olympic Coach magazine.) Remember, outcome takes many forms, often subtle and sneaky. The slightest thought or feeling of outcome increases interference. Sometimes just a little, though usually quite a bit. Generally, we have very little understanding of this area and do no training to reduce interference. This is why intermediate and higher level athletes often plateau for extended periods of time and/or have dramatically lower match scores compared to training. The two articles shed light on this area. Returning to the athlete’s match charted above, I showed her the chart and we discussed the dynamics of her match. She described the higher mode (10.5-10.7) as being delivered with the “correct” shot processes, where her mind was quiet and her focus was on observing the shot process unfold. The lower mode (10.1-10.2) had the shots delivered where she felt the slightest bit of outcome focus, concern, or thought. A very subtle yet important difference. She noted that it was only after the shot was fired when she realized the difference and she was now going to pay attention to these ever so subtle hints. Several months ago she would not have even noticed this, so she is making great progress. Finally, the outliers were clear mistakes where the active mind was in full control trying to make a score or other outcome concern and “I should have rejected.” was the common theme. In all cases, the physical and technical fundamentals were identical. The only differences were in her mind. If the differences in score are not attributable to physical and technical causes, what accounts for the variations? The differences in results are caused by differences in the mental and emotional state of the athlete. High performance requires physical, technical, mental, and emotional aspects to all be in top form and integrated closely with each other. Too often, the former two (physical and technical) and the latter two (mental and emotional) are treated separately, with little or no integration. They must be fully integrated. Did you know the size of the rifle front sight aperture ring or pistol rear sight gaps have a profound effect on the athlete’s confidence and ability to decisively deliver a shot? (See my article archive of the On The Firing Line series for articles Where Are You Looking? – Part 1 and Where Are You Looking? – Part 2, along with the resource Front Aperture Selection to determine the minimum acceptable front aperture size.) Did you know that a trigger with too light of a total let off weight actually impedes high performance, causes the athlete to be tentative, and hinders the smooth “auto-magical” shot? The mention of emotions may be off-putting to many people, especially to many boys and men. Have you ever been angry? Anger is an emotion. Is that masculine enough for you? Regardless of your gender, anger is one example of an emotional block to high performance. Thus the emphasis on both mental and emotional aspects. We must fully integrate and utilize important details from all four aspects of high performance: physical, technical, mental, and emotional. (See my article archive of the On The Firing Line series for articles Mental and Emotional Skills and P-R-N-D, among many others addressing the mental and emotional aspects of high performance.) Developing athletes, and even athletes on the international circuit, often find the blocks to performance they face are not in their performance, rather the blocks are in their interference. One little histogram from one little competition lent great insight into the state of mind of the athlete on that day, and provided much food for thought on the larger aspects of high performance. A day after discussing her histogram, we plotted another match which had a more typical bell curve shape with the mode around 10.4-10.5 with a decimal total above 621. Her mindset was a bit clearer during that match and we could clearly see a different pattern on the chart. When athletes have truly and fully “let go” of all interference, their mode is around 10.8-10.9 – though only for the shots delivered fully in that manner. No one yet does it for 60 shots! We can see the mindset difference in these shots on a Noptel or other electronic trainer. The “distance from center over time” graph of a shot allows us to see when the athlete was truly in their deeper mind and when the active mind was in charge. The latter shots also confirm the average length of human reaction time, by which time the sights are no longer centered on 10.9! Thus the bell curve histograms. At a world class winning level in air rifle, the typical score works out to about a 10.5 per shot average. There is still room for improvement! In the spirit of letting go, I suggest my article Christmas Tens and my post The Empty Method for your reading pleasure. Molly was intrigued by the histograms and the insights she could gain from our discussions, as discussed in this article. After reading the first draft of this article and reflecting on the competition, she wrote an excellent short essay. Molly graciously agreed to allow its inclusion in this article. Every match you shoot, every hour on the range you have, and every shot you take is another step in the journey. Your journey will be filled with ups and downs, nerve-racking situations, feelings of success, and feelings of defeat. The only thing that matters is how you react to these feelings, and how you can take yourself to another level in your profession, even from the feelings of defeat. Yes, I had many shots in my match that were deep. I also had shots that were not. By analyzing the shots on JP’s histogram, it gave new insights and ideas that I had never thought of in that way. For example, how many shots did I take in Flow? How many did I take while having interference? The histogram helped me answer those questions. Even though I had a number to look at, (outcome), I did not perceive it as blindly analyzing a good and bad shot without a cause or reason. I analyzed the good shots by how I got them. I also noticed the bad shots; was it a mental or physical error? When I learned from my mistake, I moved on. But I did not hold on to the shot, knowing that it was only a mental and/or physical mistake, and the score just reflected it. Considering this, it is very important to learn from the shots you take, good or bad. That is why every shot you take is another step in the journey. By learning from what you did, responding with a constructive attitude, and acting on what you learned in training will ultimately make your outlook on bad shots or matches in a positive and useful way. Hopefully, this post and linked articles provide some insight and generate reflection on your part into how much the “Mind Matters” in all your activities, whether in sports, music, dance, other types of public performance, school, and work. Advertisements may appear at the end of this post. I have no control of whether they appear or their content. Please take a look at these two groups. The air group was shot by a brand new shooter (two months of light training) in the standing position with no suit or boots. The smallbore group (A-36 target) was shot in the standing position by an experienced air rifle shooter in her first weekend of smallbore. What do you see? How would you evaluate these targets? How would you discuss them with yourself if they were yours or with the athlete? Did your answer involve the use of the word “flyers” or anything related? Did your answer emphasize the one or two wide shots or the majority of the shots near the middle of the group? Did you emphasize score or the size of the group? From now on, the word “flyer” is prohibited! There are two groups, not one. When we first start to shoot, our “group” may look more like a shotgun pattern. Quickly we learn and our group shrinks. Soon enough, we get targets like the ones shown here. Each target illustrates two groups. The main group is what people generally refer to as “the group” when discussing a target. As we make progress, the main group becomes smaller and it has a higher percentage of the shots. The outer group are the wide shots that aren’t in the main group yet. As we make progress, the outer group also shrinks and it has a lower percentage of the shots. Eventually it, too, shrinks and all the shots are in the main group. 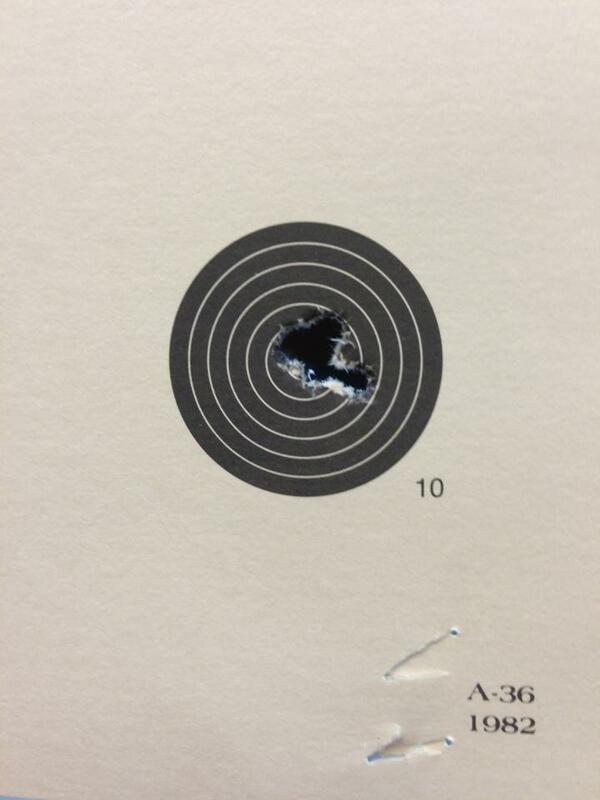 Even in the smallbore target above, there are two groups even though all the shots touch. At least one shot is obviously not truly in the main group. Focus your mind and thoughts on the main group. It is your future. The outer group is your past. Which way are you headed? Answer: in the direction you spend the most time thinking about. Recently at a collegiate match, an athlete commented on how he had shot a 7 in a practice session that week. His coach, whom I greatly respect, immediately responded: “No that is not how you talk about that session! You shot a 591 with 54 tens!” The athlete got the point! I like to look at a match result with an athlete this way: Lets see, 34 Xs, 19 tens, and 7 nines. The X count is growing! Focus on the positive and the future. Congratulate yourself on those tight main groups and let the process take care of the outer group for you. This blog is specifically for athletes and coaches engaged in the sport of Olympic Rifle and Pistol target shooting. However, shotgun participants, and participants in any other sport or performance activity (music, singing, dance, public speaking, etc.) will find that much of the content applies to their activity as well. The primary emphasis of the blog is on the mental (e.g. self talk, focus, etc.) and emotional (e.g. anger, fear, etc.) aspects of thriving under pressure. These are universal themes applicable to all performance activities. Posts will be at varying though hopefully somewhat frequent intervals. Time will tell how often and how in-depth. Please read the About and Author pages of this blog site for further information about the blog and the author. Please also feel free to go to the Contact page to send me your comments, suggestions, and topic ideas. During November and December of 2013, the blog will be in “start-up” mode with official launch in 2014. 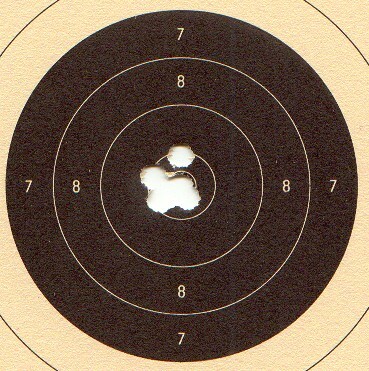 The target shown above, scoring 50-4x, was fired at the 2002 USA Shooting National Championships hosted by the US Army Marksmanship Unit at Fort Benning, GA in the demonstration event of Standard Air Pistol. This is a ten second series, fired at a slightly too rapid tempo with a Steyr LP-5, in only eight seconds – with an audience. No pressure!